Whooping Crane identification sheet by the Louisiana Department of Wildlife and Fisheries. Louisiana Wildlife and Fisheries officials are still seeking information leading to the arrest of those responsible for the early February 2014 Jefferson Davis Parish killings of two Whooping Cranes (WHCR). The reward has grown to $20,000 thanks in part to donations from along list of private individuals and nonprofit groups including the Humane Society of the United States, the International Crane Foundation, the Audubon Nature Institute and the San Antonio Zoo. 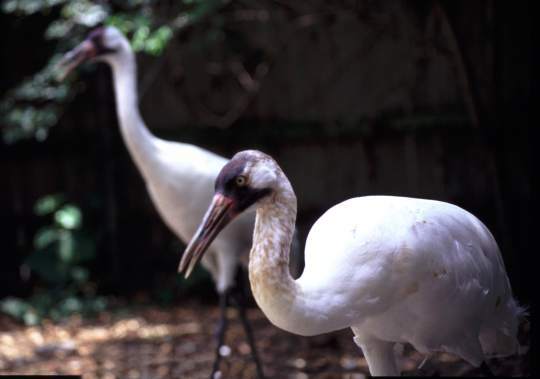 In 2011, two Whooping cranes in the reintroduction project were also shot and killed in Jefferson Davis Parish. Two juveniles were found responsible for those deaths. In 2013 another WHCR was killed in the Red River Parish. No one has yet been arrested in that case. For information about the whooping crane reintroduction project, visitwlf.louisiana.gov/wildlife/whooping-cranes. Male Whooping Crane shot in southwest Louisiana after surgery to repair shattered wing bones. The Louisiana Department of Wildlife and Fisheries announced yesterday, February 19, that the male Whooping Crane shot earlier this month and underwent surgery to repair two shattered wing bones, has been euthanized. The crane was reported doing well following surgery February 9 at the Louisiana State University School of Veterinary Medicine. However, early this week its condition began to rapidly deteriorate. The bird euthanized Wednesday was among 50 Whooping Cranes released in southwest Louisiana since early 2011 in an attempt to create a flock like the one that once thrived there. Thirty-one cranes remain alive. The 19 deaths include five shootings; others were from predators or natural health problems. The Louisiana Department of Wildlife and Fisheries (LDWF) announced Wednesday that the reward has been increased to $15,000 for information that leads to the arrest and conviction of the person or persons responsible for shooting two whooping cranes found in Jefferson Davis Parish on February 7. Organizations and individuals contributing to the reward fund include the Humane Society of the U.S., the Louisiana Operation Game Thief Program, Dr. Ben Burton, the Louisiana Wildlife and Fisheries Foundation, the Animal Welfare Institute, Operation Migration, the International Crane Foundation, Jacksonville Zoo and Gardens, Audubon Nature Institute, Lowry Park Zoo, Zoo New England, King White and anonymous donors. LDWF has been working to restore a wild whooping crane population in Louisiana. Fifty juvenile cranes, brought to Louisiana in four separate cohort groups, have been released at LDWF’s White Lake property near Gueydan since 2011. Prior to this incident, 33 of those birds were alive and well on the landscape in central and southwest Louisiana. Some have been lost to predators, some to naturally occurring health problems, and five in total have been confirmed as killed or wounded by firearms. The injured mate of the killed Whooping Crane was taken to the Louisiana State University School of Veterinary Medicine in Baton Rouge where it underwent 5 1/2 hours of surgery to repair two wing bones – the humerus and radius – broken by gunshot. 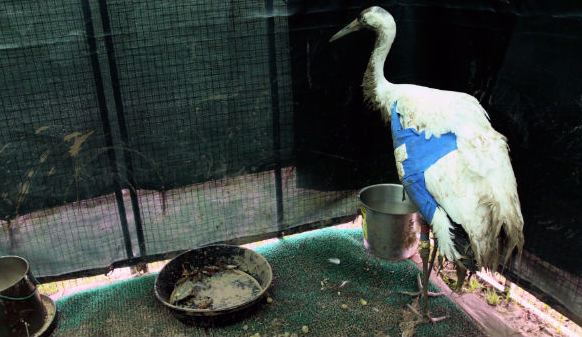 It now faces a long period of rehabilitation and it is unknown whether the crane will ever be able to fly again. Read more from the Louisiana Department of Wildlife and Fisheries here. Read more from Gulfnews.com here. Of the FIFTY Whooping Cranes that have been released (in a cooperative effort by LDWF, USFWS, USGS, and the Louisiana Cooperative Fish and Wildlife Research Unit) in an attempt to create a flock as once was found in southwest Louisiana before their extirpation from the state, thirty-two are still alive. Thursday, February 6, 2014 a pair of Whooping Cranes was found shot near Roanoke in Jefferson Davis Parish, Louisiana. According to a nearby landowner the two cranes had been seen recently in close proximity to a large flock of snow geese. 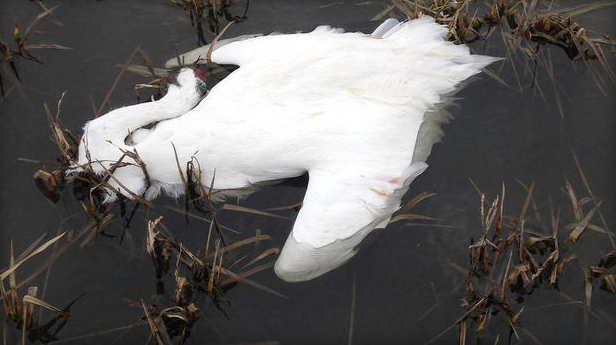 Louisiana’s goose season is still open and both shot Whooping Cranes were hit with birdshot. It is believed the shooting was intentional as it would be impossible to confuse a Whooping Crane with a Snow Goose. The pair of cranes had formed a mating bond in 2013 and, while too young to produce eggs, were building practice nests. While the female was killed, the male has significant damage to one wing. It may live but it is unknown whether it will be able to fly again. Until the early 1900s, whooping cranes were a fairly common sight in southwestern Louisiana. 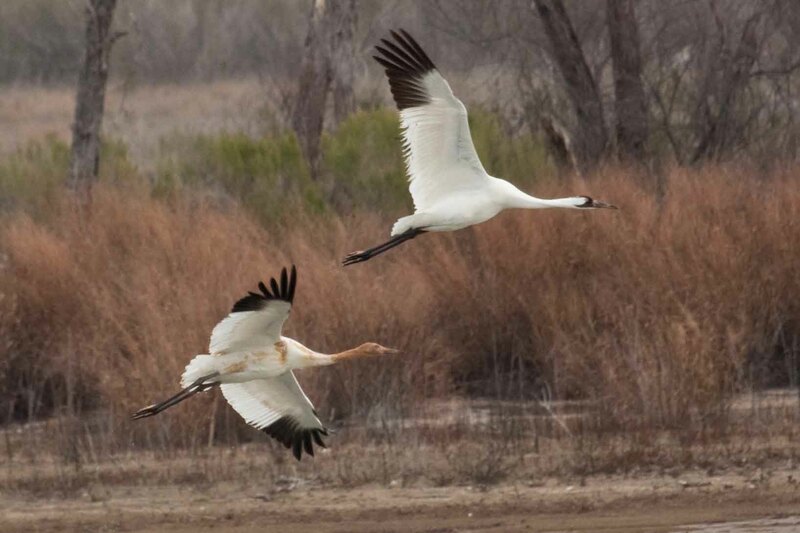 “At one time, Louisiana had more whooping cranes than anywhere in North America,” said Sammy King, of the U.S. Geological Survey Louisiana Cooperative Fish and Wildlife Research Unit at the LSU AgCenter. As late as the early 1900s, a migratory flock wintered every year in Louisiana, and a resident flock stayed in the White Lake area in Vermilion Parish, King said. Before the 14 new birds arrived in November 2012, there were 14 whooping cranes in Louisiana from two previous groups. Of the first 10 birds brought to White Lake in February 2011, only two are still alive. A dozen of the 16 birds from the second cohort brought in November 2011 have survived. Like the two previous groups, they were raised at the U.S. Geological Survey Patuxent Research Facility in Maryland until they were six months old. Of the birds that didn’t survive, some were taken by predators. Two were shot in October 2011 in Jefferson Davis Parish by two juveniles in a pickup truck. The most recently shot to death whooping crane was found and recovered from the bank of the Red River about two miles northwest of Loggy Bayou on April 16, 2013. After a necropsy of the crane, it was determined that the bird was shot with a 6.5mm/.264 caliber projectile. LDWF is working cooperatively with the USFWS, USGS, and the Louisiana Cooperative Fish and Wildlife Research Unit to bring the species back to the state. This non-migratory flock of whooping cranes is designated as a non-essential, experimental population but is still protected under state law, the Endangered Species Act, and the Migratory Bird Treaty Act.